BAYOU CORNE — Eleven new bubble sites have been found in inundated swampland west of an 8.5-acre sinkhole in northern Assumption Parish, including a frothing spot dubbed the “mother of all bubble sites,” officials said Tuesday. The sites are roughly in a row west of an unnamed oilfield access road extending south from La. 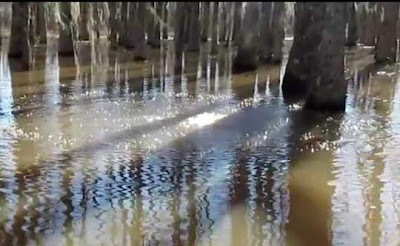 70 South through the wooded swamp, a parish map shows. 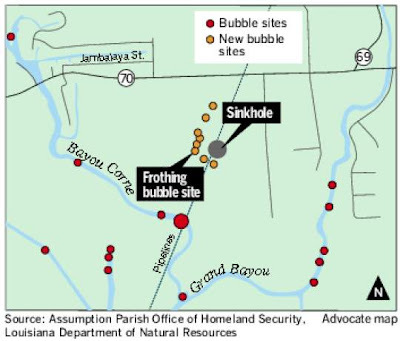 The sites bring to 34 the number of known bubble sites in the Bayou Corne and Grand Bayou areas in the vicinity of the sinkhole on Texas Brine Co. LLC’s leased property. My guess is that the people who were ordered to evacuate from their homes last year will very likely never be able to return. The troubling situation in the area is worsening, and who knows when or where it will end? I wonder if further numbers of residents of nearby areas may be asked to leave. Highway 70, a much used road, is near the sinkhole activity. If the highway is impacted and forced to close, it will greatly inconvenience workers and travelers in the area. The "mother of all bubble sites"
If we take stuff out from under the ground beneath us, why are we surprised when the ground beneath us collapses? When will we ever learn? Is it because this area is already a swamp, that the extraction industries are even more careless re how they extract and its consequences? JCF, the salt extraction goes back a long time, and since the businesses today do the bare minimum with regard to safety and non-pollution, they probably did even less back then. Add to the mix that the carved out salt domes are used to store oil and gas, and I can't see how you have anything but a mess on your hands. I don't know anything about this site, but would I be right in guessing the people who made money out of the digging were different from the people who had to evacuate their houses? If so the answer to your question is probably 'Not until people love their neighbours as themselves'. That'll be a long time. Jonathan, I'm not certain, but I doubt very much the property owners made money off the extractions from the salt dome, because the activity probably goes further back than the development of the home sites. The officials of the state and many of the citizens still see extraction of oil, gas, or salt as benign activity which brings in income. We haven't suffered enough yet from "Drill, Baby, drill." None of the leadership seems interested in exploring clean energy business development as a source of jobs, which I think is extremely short-sighted. That's one fine mess they've got us into, and it's no joking matter.